6" x 8"8" x 10"9" x 12"11" x 14"12" x 16"14" x 18"16" x 20"18" x 24"20" x 24"20" x 30"22" x 28"24" x 36"
placed my first order with picture frames ... the frame was beautiful .... an extremely good price for a beautiful frame that was easy to install my painting in .... great product ... great price .... quick delivery ... what more could one as for? i highly recommend! Very nice indeed, love that antique look... Really brings out the Spencer art.. This is the only frames that enhance the artwork..
My client wanted an antiqued frame to go along with other frames in the room. The painting is fairly large and needed a wide moulding. This is all wood with a fairly subtle finish. It looks great on the wall. Too expensive overall, but I loved the look. Hated having to assemble hanging hardware & wire on each one. I had one that was damaged. I called, emailed pictures & they sent me a replacement. I liked that I did not have to send the damaged one back for credit/exchange. However, it did not have the flat tacks in the back to hold in picture, et al & the clips in the hardware kits do not hold snuggly...so I will have to rig something up for a frame I paid a fortune for. Did not like having all this work! I am just praying that the other frames don't develop peeled off spots that one I received damaged had. Hello Michelle. Thank you for shopping with us. We hope to thrill you with each and every order, and we regret this one did not work out for you. Thank you for calling in and allowing us to replace the frame for you. We are hoping to make this right with you. We apologize that you were expecting the tabs to be in the back of the replacement frame. The tabs are for shipping purposes only, and are only used to hold acrylic and backing in the frame. With each order you can expect to receive the retainer clips to hold in the backing. Please let us know if you have other concerns. Thank you for your business. I love your frames. These wil go very well with two new pastels I purchased. Looked nice and wanted to not disburb the colors Ive chosen for the canvas. These appear to be very sharp, high quality frames. It matches other frames that I currently have and will be a nice addition to my gallery wall of family photos. It went with the painting. I have a Thomas Kincaid print. I want a wood frame without a mat but a white edging inside the frame because the picture has a white border around it? I can let you know which print it is if you need to know? BEST ANSWER: As a photographer and frequent frame buyer I can suggest a few ideas, either chat with the Frame Experts at pictureframes.com to see if this feature is available on anything they have in stock OR buy any style frame you like and use a flat white paint to paint the inside edge of the frame before you insert the picture of course! I don't even have to have the white edge. I want to know what size frame do I get where the picture will only show through the opening without the edge around the picture? Also, what do I get to put in the back of the print? Not sure if you have the finished size of the item you are putting into the frame yet but when you do, order a custom frame size . Measure the outside of the item and order the frame accordingly. You will have to get the print mounted onto a foam core or Gator foam to keep it where it belongs in the frame. For example, an 11x14 print, order a frame that has an opening exactly 11x14 then the frame will have a 1/8 per side more space. The foam core should be 11.25x14.25 or there abouts. Chat with the experts on the site to be sure you get what you want. Hi Rhoda, Our customer care team can certainly assist you in finding the perfect frame for your print. They are available Monday-Friday 8am-7pm eastern time and can be reached at 1-800-332-8884. Thank you! I used this frame for a stretched canvas and don't recall any white. the frame is wood, so if you're looking for a thin white edge you could use a linen spacer or look for a different frame. Can this frame be returned? 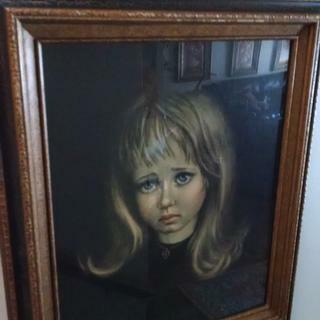 I ask because it's looks gold and blk however in the pictures sent in by one of the customers the frame looks darker to me and more like brown rather then the gold I'm looking for. Maybe it's just the shadow in his hallway but just in case it's not I would like to be able to return this. BEST ANSWER: Hi Michelle. This frame can be returned to us. We have a 45 day return policy for all of our frames, excluding clearance items. If we can be of further assistance, please let us know. Happy framing! I have a stretched canvas piece of art 30 wide x 20. My question is if this frame 2ETS will accommodate my art? The art is I guess 1 inch deep. Yes is a question Thank you. BEST ANSWER: Hello. 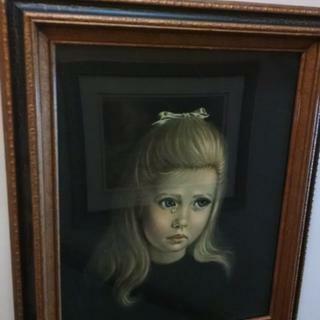 Unfortunately, this gorgeous frame does NOT have the rabbet/depth to support a 1" canvas. The depth of the frame is only 3/8". Please consider the frame style below as an option. Thank you for your inquiry!